I am an inveterate browser on eBay, particularly the wristwatches section. 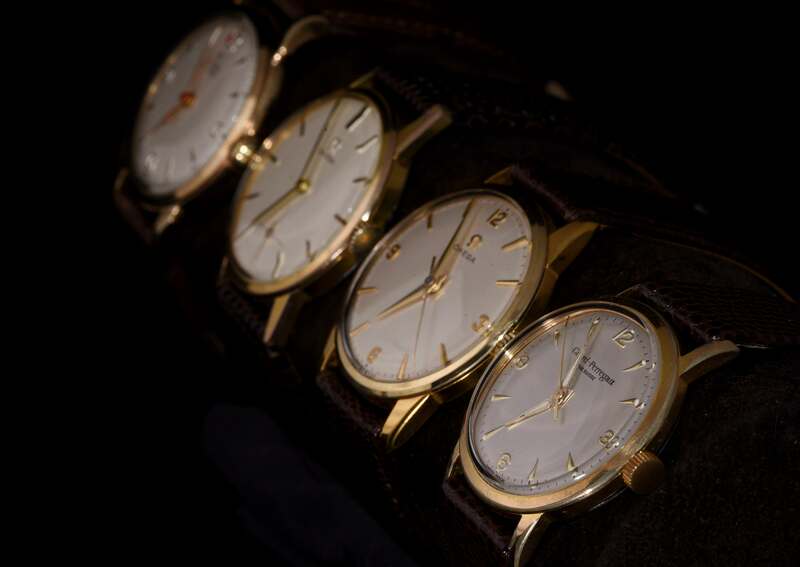 Early in January this year I came across a lot containing what were simply described in the title as “Old Gold Wrist Watches”. Looking at the picture it was clear there was a Roamer and an Avia…but what was that indeterminate third watch? 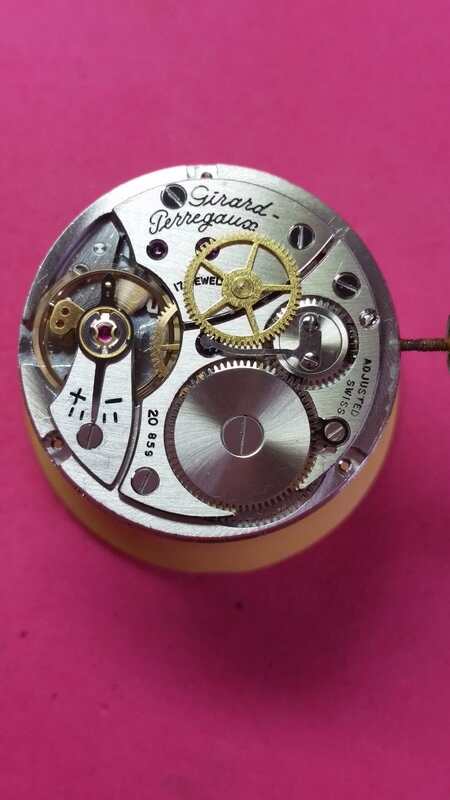 The detailed description – in as much as you can call it detailed – simply described it as a “Girard”, so I immediately thought “Girard-Perregaux”. It was difficult to tell anything much from the photo, other than the dial looked in poor condition, but I kept my eye on the lot and eventually put in a late starting bid of £19.99 that turned out to be the only one. 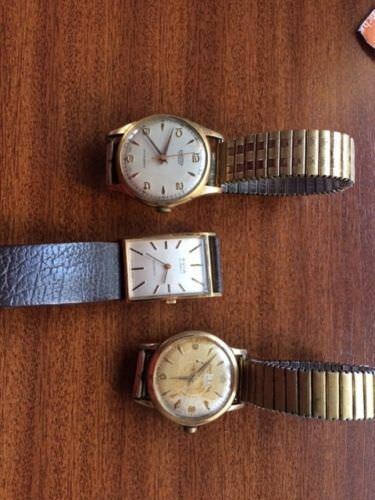 Three watches for a penny under £20 was hard to argue with! The watches arrived and when I unwrapped them sure enough the third watch was a Girard-Perregaux. 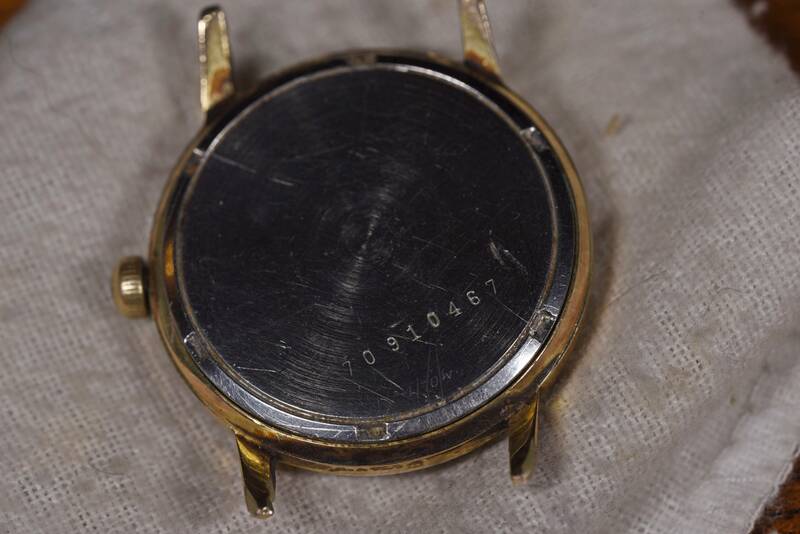 It was in a pretty sorry state, though, with quite a bit of wear on the case but also significant damage to the dial. Thinking it could well be the result of water damage it was with some trepidation that I removed the case back, only to be delighted to find that the movement itself was very clean. 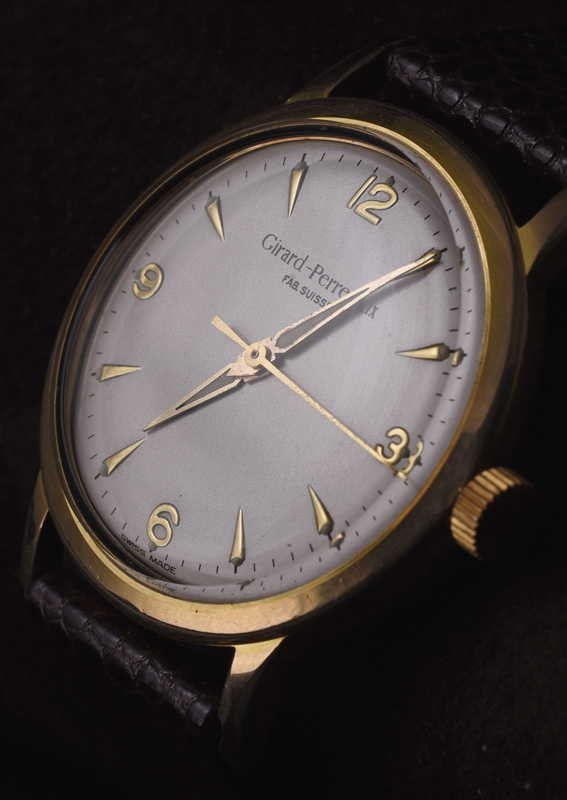 It was a Girard-Perregaux Calibre 20, which according to Ranfft is a modified Peseux 335 (http://www.ranfft.de/cgi-bin/bidfun-...d-Perregaux_20) dating from the 1960’s. 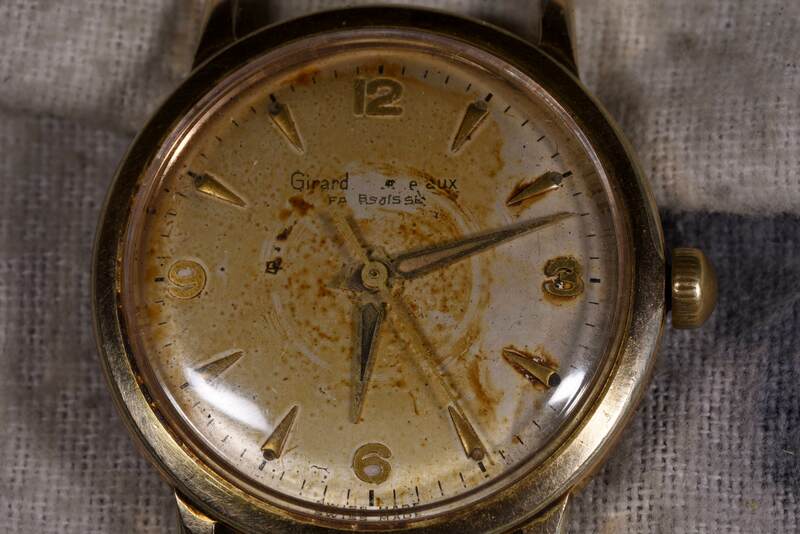 With my penchant for dress watches of that era I immediately thought about getting it restored. 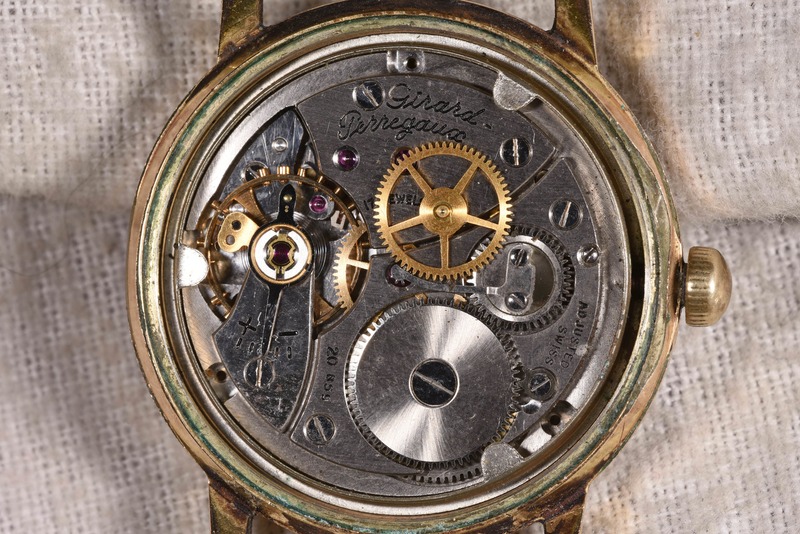 I have seen redials before and know that many feel a redial spoils a vintage watch, but it was simply unwearable in its current state so there was really little choice but either to scrap it or restore it. I was travelling in Europe for work at the time, but a quick exchange of emails with Brendan (webwatchmaker - who has serviced and repaired a number of my other watches) resulted in me packing up the watch when I got back home and sending it off to him in order to get an expert’s opinion. 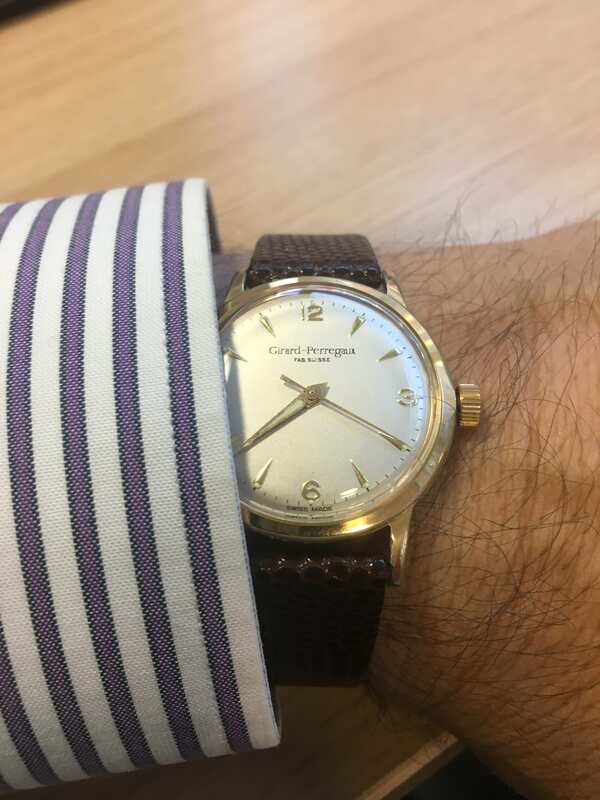 A couple of weeks later and I heard back from Brendan – he had stripped down the watch and as well as the obvious dial restore it was going to need a service and a new crystal, crown and mainspring. This was clearly not going to be cheap, so I cautiously asked for an estimate. Brendan reckoned that, all in, I was looking at somewhere North of the £300 mark. Hmmm…..that seemed quite a hefty investment for a watch that only cost me about £7. Some might justifiably question why go ahead, particularly for a watch that held no personal sentimental value. 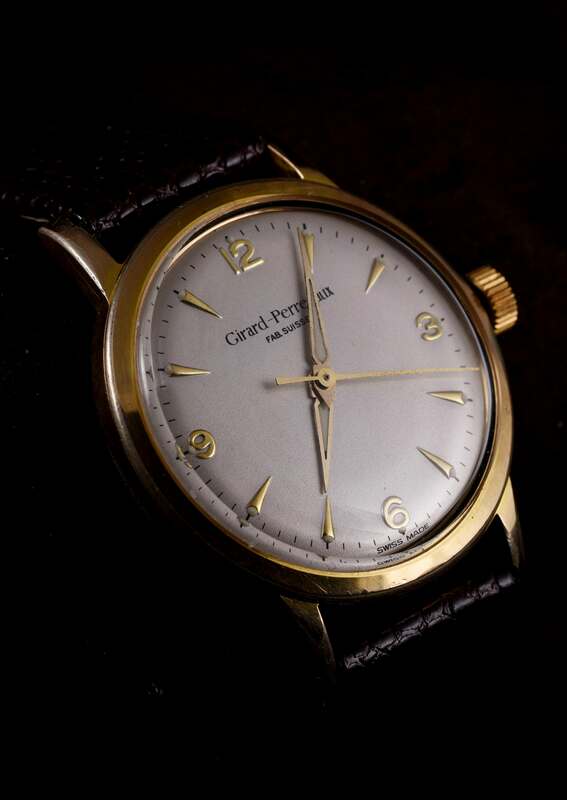 Against that, though, the movement was in great condition, the case could be made dustproof for everyday use, it would be my first Girard-Perregaux, and it seemed such a shame to scrap a watch that still had the opportunity to be worn and enjoyed. So after a few moments of deliberation I decided to go ahead. Brendan recommended using a Swiss dial restorer, but I have to say that I was really unsure quite what could be done with the dial in such a state. Ten days or so later an email from Brendan appeared in my Inbox letting me know that everything was back and ready to be reassembled. 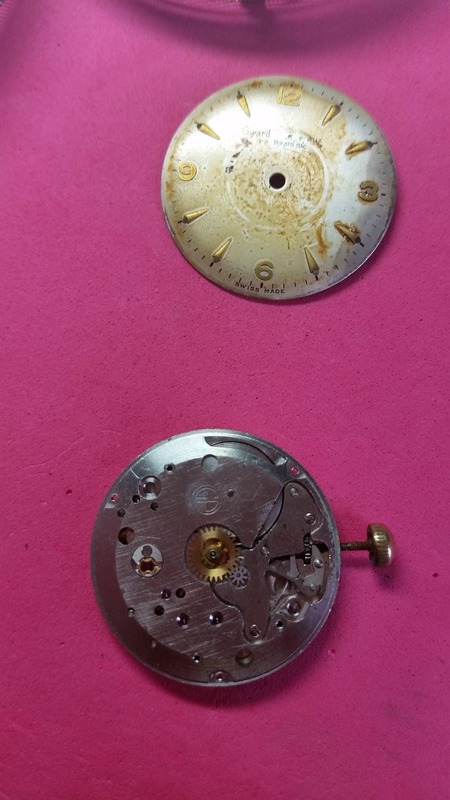 Brendan had cleaned up and re-lumed the hands to match, and as it turned out the mainspring hadn’t needed replacing after all. The photos of the dial surpassed my expectations. We had earlier discussed finding a better case, and at some point I’d love to source a suitable one in solid gold, but for the meantime decided to stick with the original. I was again abroad last week, so arranged with Brendan for the watch to be delivered on Friday. I didn’t catch the postman when he called, but the watch dropped through the letterbox and I unwrapped it with growing excitement……which turned to despair when I saw that the minute hand was rotating freely with no friction. Thank you Royal Mail! As you can see, it’s perhaps a couple of millimeters smaller in diameter than the Omegas it shares a watch box with, but very similar in size to the solid gold Roidor at the far end. Despite its diminutive size compared to the modern fashion for watches it sits beautifully on the wrist. So far it is keeping excellent time and I’ll track it over the next couple of days to see how it fares. I am delighted with how the watch has turned out. I know some will be shaking their heads at the cost, and others the redial, but it is lovely to have it sitting here in front of me now and thinking that – with care – it will go on bringing enjoyment for perhaps another 50 years or more. 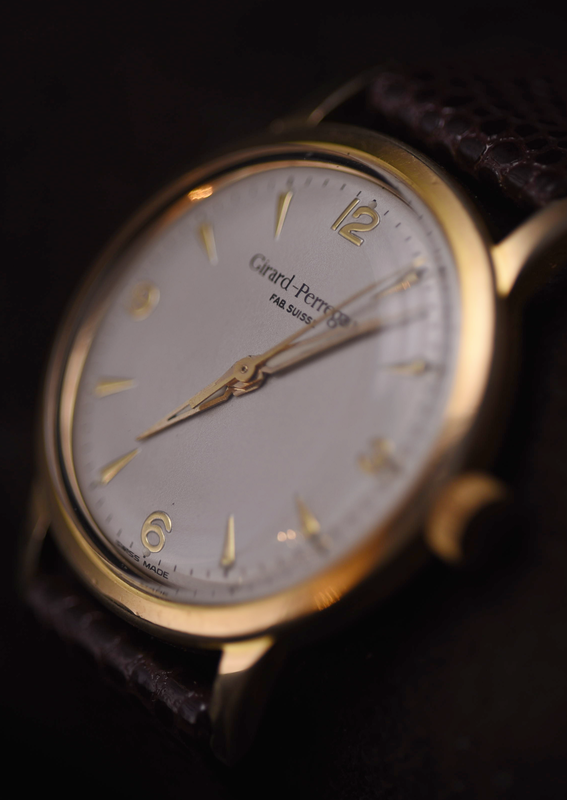 I was hoping to find out more about its history, but that database of Girard-Perregaux serial numbers remains elusive. A huge vote of thanks to Brendan for the wonderful restoration work, the frequent updates and photos, and the honest and forthright advice given throughout. P.S. So far as the other two watches, the Roamer only ticks for a few seconds and needs to go for a thorough service. The Avia, on the other hand, works like a dream and keeps surprisingly good time. Got to say that dial turned out very nice indeed, infact the whole project did. What a cracking find. Wish I was that lucky. This kind of posts make me think that I should change the direction of my collection. It would be less expensive and more gratifying. Many thanks for sharing! Well done for bringing that watch back to life. Although I prefer originality, there are circumstances when needs must, and this was such a circumstance IMHO. Thanks for such an informative post. I actually swore out loud (to the amusement of my fellow commuters..) when I saw the "after" shot of the dial! That's a great write-up and excellent pictures. 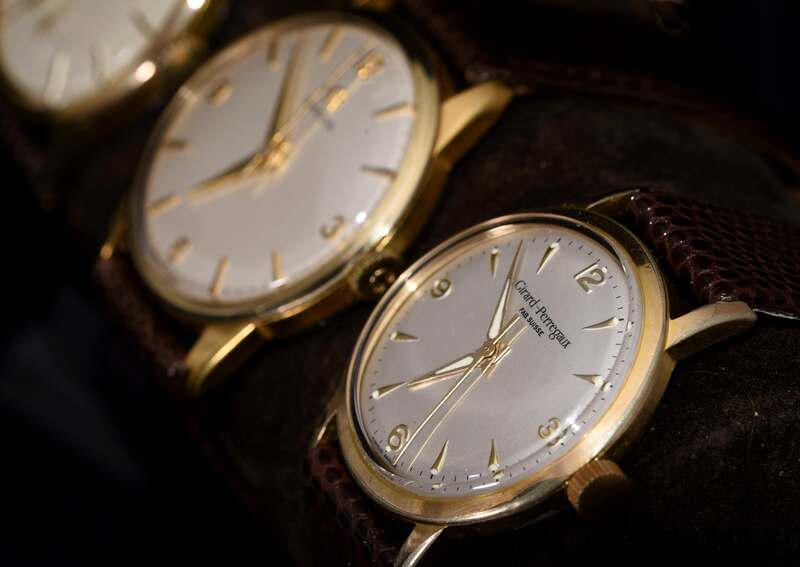 Amazing to see the restored watch - i found myself immediately searching ebay for "Old Gold Wrist Watches" to see what else there might be out there! Last edited by kermorvan666; 20th February 2018 at 22:36. What a lovely dial. Well done that man, a new lease of life for a watch which probably has a few stories to tell! That looks like a completely different watch now. Nice one! The watch was restored for about the price of a Panerai strap . Great save! Well done all. Fabulous work, and we'll worth every penny. Think of it as saving the life of another vintage watch, something that is always worthwhile. Thanks all for the kind comments, but it is Brendan who deserves the plaudits for the great restoration work. This is absolutely amazing. Been meaning to send a watch to Brendan for ages will have to get a move on. What a fabulous story/ thread, thank you OP. Respect to you for going ahead with it, not easy to spend so much money after such small initial cost, and full credit to Brendan and the Swiss dial restorer. What amazing work, turned out a real beauty and must be rewarding wearing it knowing it was brought back from such a sad state. Really enjoyed reading this with my morning cuppa. 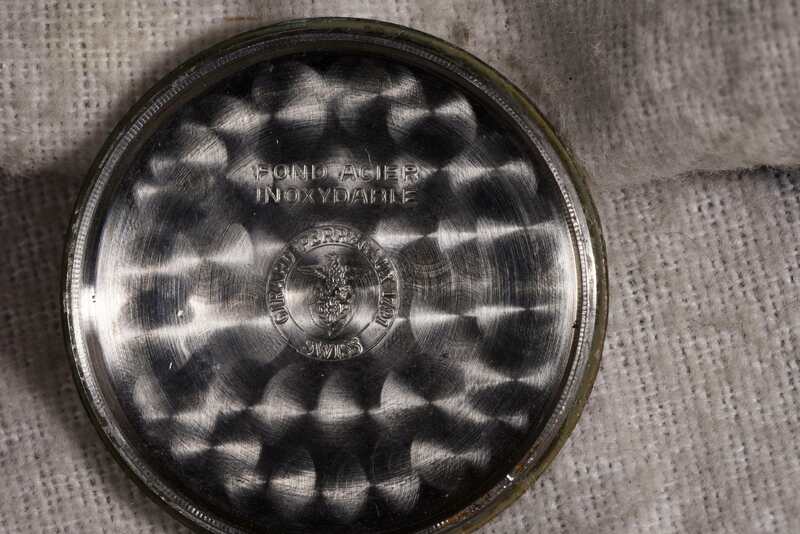 Yet another lovely story of a watch being brought back to life. 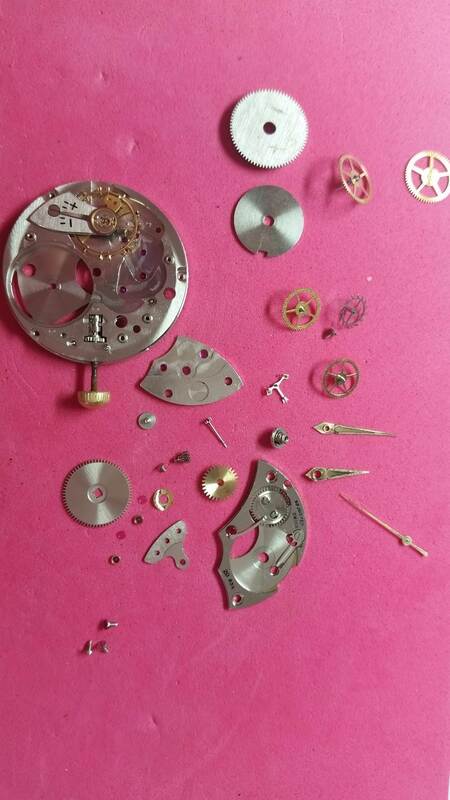 Fabulous work done by Brendan, and the dial restorer, to give you a classic watch for the collection. What a great way to a GP! I’m sure it was a diffcult decision to invest in the restoration, but, as it turned out well worth it! Great story, and write-up, and if it encourages others to try and bring other vintage pieces back, then that’s great! Thanks for sharing, and I hope you enjoy the watch, which looks very classy on! The restoration looks great, with very nice raised numerals/indices and very original looking lume dots, even though they have been added to the quarters when they were not there at the start. I will add that the G-P font, whilst lovely, could have been closer to the original. But the overall effect is lovely, and a distinct improvement on its previous state, which looked like a water slide transfer had been smooshed round the dial by the hour hand. Thanks for the comments Dave. Your comments raise an interesting question about how close to the original do we want to go. A signed GP crown would be ideal, and I don't see that as detracting from originality. 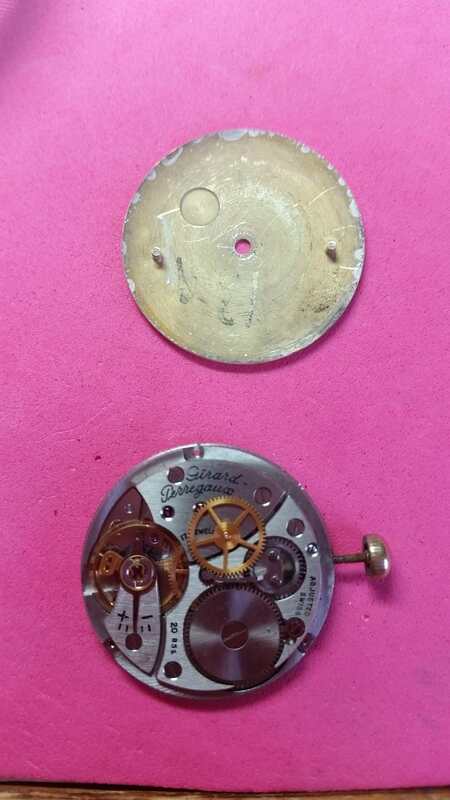 However I also mentioned about considering a replacement case, and pondered trying to find a complete replacement dial, but the danger is that you then end up with something a bit like Trigger's broom, where nothing is left of the original watch other than the ebauche. Figuring that there was no getting away from the fact that the redial was necessary, and with no intention of duping anyone into thinking otherwise, I am happier in the knowledge that the dial itself is original (albeit repainted) than a replacement. It's for personal wear, not sale, so I plan to just enjoy it for what it is. I did ask Brendan what he thought might have caused the damage to the dial, and whilst he had some suggestions we shall likely never know. It could have been condensation, could have been excess oil from a previous service, could have been excess heat.....not seen this type of damage before so it's all guesswork. Any suggestions gratefully received though! 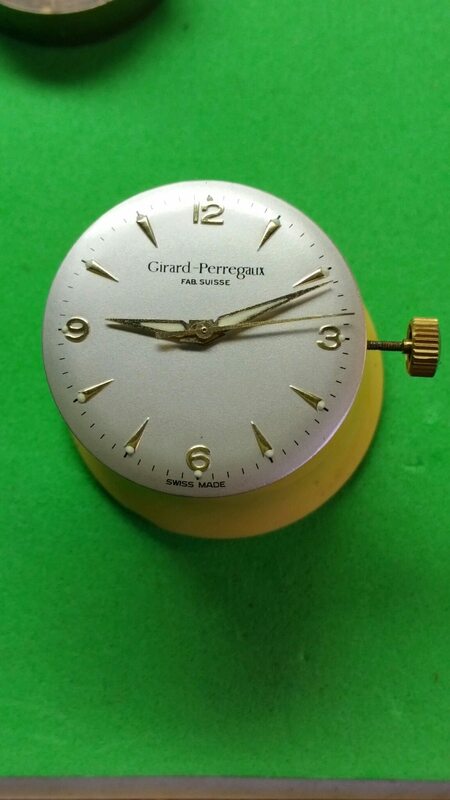 I have contacted Girard-Perregaux to see if they can at least help date the year the watch was made, so hopefully I'll hear something back. What a great story. Thanks for taking the time to write this up. You have ended up with a fabulous looking watch. As I said in my post, I think it looks great. And you are right, the re-dial was necessary, so I applaud your efforts and persistence to spend the money and make a great job if it. But I wonder, because watch collecting is a field that obsesses over details. In this digital age when really good hi-res photos of original fonts are clearly available with a swift google (and I have checked, they are for G-P too), surely it does not take too much extra to get the right font, in preference to an admittedly good-looking facsimile? The Fab Suisse looks almost identical. The G-P not. I have had this discussion here before, especially in regard to re-printed chronograph dials. The standard of printing (in terms of detail and crispness) on restored dials is often exceptionally good. And the base colour (as here) is also a very fetching silver with a nice texture. Just as original. So the font thing really seems to stand out as the last thing to reach the highest of standards that we ask of our restorers. I would say for a high-end dial restoration, then yes the fonts should be as accurate as possible. For something like this, a good, honest but pretty low value watch, then 'near enough' would certainly do me and I wouldn't worry if it was a bit different - I would be as pleased as willie_gunn is with the lovely end result. I'm inclined to agree. Like you and everyone else I think the OPs watch looks great and a vast improvement. But the fonts difference would niggle me along with the apparent rounding of the edges of the applied/embossed numerals. As a result of my admittedly strange approach, I have watches with dials that have marks and staining, that I would never do more to than gently clean, leaving a them looking much worse than the OPs to most eyes but preferable to me. I've also spent 10x the value of a much less remarkable watch bringing it back to life, so due respect to the OP on that score as well. I loved this post. The Watch turned out amazing. I wouldn’t have believed it could be done. You have a beautiful watch. Well done !!! Stunning work on the dial and the movement. Who would have thought that they would have looked so good after all those years. I'm going to send all my watch repairs to this guy.....!